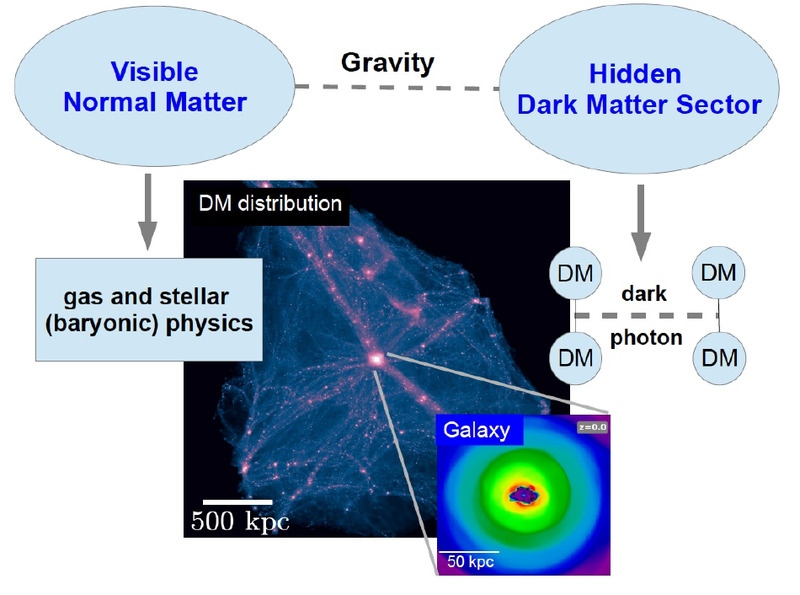 Collisional Dark Matter and Galaxies: The first galaxy in the world within SIDM!! The first galaxy in the world within SIDM!! Together with Mark Vogelsberger, Christine Simpson and Adrian Jenkins, we have performed the first simulation in the world within the cosmological context of Self-Interacting Dark Matter!! In the figure below, I show an schematic description of what we have done. In previous works, we had studied the distribution of dark matter in a SIDM cosmology. In this work, we have added the physics of the gas and stars (hydrodynamics, star formation, supernovae,...) using the code AREPO. The ordinary matter and SIDM are coupled through gravity and the end result is a dwarf galaxy that globally looks similar to the analogous simulated galaxy in CDM, but that in detail differs substantially. In particular we found that the stars are centrally distributed in a way that mimics the flat dark matter distribution of their SIDM halo. This a promising result: the signature of dark matter collisions could be imprinted in the stellar distribution of dwarf galaxies. In this link you can read the full paper.